On Friday, Dec. 19, 2008, death-row journalist Mumia Abu-Jamal filed his appeal to the US Supreme Court, asking it to consider his case for a new guilt-phase trial. One month before, the Philadelphia DA filed its separate appeal to the court asking to have Abu-Jamal executed without a new sentencing-phase trial. Both are appealing the March 27, 2008 rulings by the US Third Circuit Court. 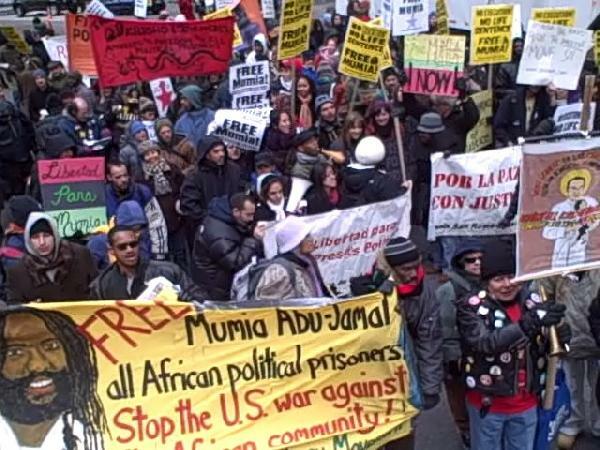 At this critical stage in Abu-Jamal’s case, supporters organized a week of global solidarity actions that began on December 6, the day of the main protest in Philadelphia. 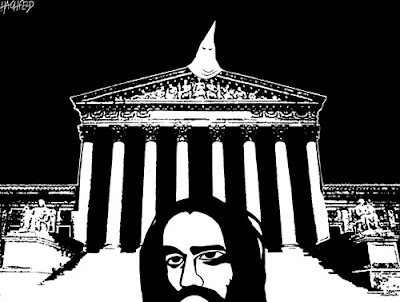 On Friday, December 19, 2008, death-row journalist Mumia Abu-Jamal filed his appeal to the US Supreme Court, asking it to consider his case for a new guilt-phase trial. One month before, the Philadelphia District Attorney filed its separate appeal to the US Supreme Court asking to have Abu-Jamal executed without a new sentencing-phase trial. At this critical stage in Abu-Jamal’s case, supporters organized a week of global solidarity actions that began on December 6, the day of the large protest in Philadelphia, almost 27 years after Abu-Jamal was arrested for the December 9, 1981 shooting death of white police officer Daniel Faulkner, and later convicted in a 1982 trial that Amnesty International has declared a "violation of minimum international standards that govern fair trial procedures and the use of the death penalty". There were solidarity actions inside the US and around the world, including Mexico, Venezuela, Germany, France, England, and Switzerland. Several US events screened the new DVD video titled Fighting for Mumia's Freedom: a report from Philadelphia. In Philadelphia, over 200 protesters gathered outside the District Attorney’s office across the street from City Hall. Journalists for Mumia’s new video report from the demonstration features an interview with persecuted Civil Rights Lawyer Lynne Stewart, and footage of Pam Africa speaking outside the DA’s office about the newly discovered crime scene photos taken by press photographer Pedro Polakoff, and the DA’s role in hiding them from the defense. A member of the MOVE organization and coordinator of the International Concerned Family and Friends of Mumia Abu-Jamal, Pam Africa cited Polakoff’s statements today that he approached the DA’s office with the photos in 1981/82 and 1995, but was completely ignored by them. Subsequently, Polakoff’s photos were never seen by the 1982 jury, or by the defense. Africa presented the evidence to Philadelphia PD Civil Affairs Captain William Fisher to deliver to DA Lynne Abraham. Protesters marched from the DA’s office to the Federal Court Building where Abu-Jamal had oral arguments on May 17, 2007. The march stopped at the 13th and Locust crime scene where Journalists for Mumia gave a presentation focusing on the photo by Polakoff that shows a blank space where key prosecution witness Robert Chobert testified to being parked in his taxi as he allegedly observed Abu-Jamal shoot Faulkner. An online video of the presentation is available alongside the special presentation flyer. In Mexico City, Mexico, supporters organized a week of actions, including a protest rally outside the US Embassy. Linking Mumia’s case to repression and political prisoners in Mexico, speakers at the US Embassy included ex-Atenco prisoners Edith Rosales and César del Valle, as well as a guitar performance by Atenco survivor Jorge Salinas, whose arms were temporarily paralyzed and hands fractured when he was almost killed by police at Atenco. Survivors Mariana, Edith y Norma who courageously told their story of being raped at Atenco. Solidarity statements were read from Mexican political prisoners Gloria Arenas Agis and her husband Jacobo Silva Nogales, and from the Atenco political prisoners in the Molino de Flores prison at Texcoco, México. Berlin, Germany’s, week of solidarity culminated in a demonstration where hundreds marched to the US Embassy with slogans like "Freiheit für Mumia Abu-Jamal - Weg mit der Todesstrafe überall" ("Freedom for Mumia Abu-Jamal - Abolish the death penalty everywhere"). Also demonstrating the international interest in this case, the new British documentary film about Abu-Jamal, titled In Prison My Whole Life, premiered December 8 on the Sundance Channel. 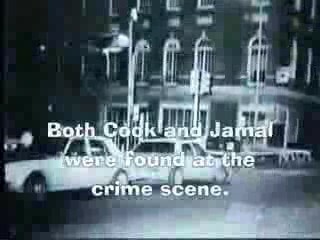 Previous interviews with William Francome, and Livia Giuggioli Firth, revealed that In Prison features an interview with Abu-Jamal’s brother Billy Cook, and the newly discovered crime scene photos. Officially endorsed by Amnesty International, Amnesty UK Director Kate Allen said: "We hope that the film's viewers will back our call for a fair retrial for Mumia Abu-Jamal--and also support our work opposing the death penalty in the US and around the world." Both the DA and Abu-Jamal are asking the US Supreme Court to consider their appeals of the March 27, 2008 rulings by the US Third Circuit Court, when the court denied Abu-Jamal a new guilt-phase trial but ruled that there must be a new sentencing- phase trial if the DA still wants the death penalty. Therefore, Abu-Jamal is appealing for a new guilt-phase trial, while the DA is appealing to execute him without a new sentencing-phase trial. On October 6, 2008, the US Supreme Court rejected an unrelated appeal from Abu-Jamal. On March 27, 2008 the US Third Circuit Court's three-judge panel of Thomas Ambro, Anthony Scirica, and Robert Cowen ruled against three different appeal issues, refusing to grant either a new guilt-phase trial or a preliminary hearing that could have led to a new guilt-phase trial for Abu-Jamal. However, on the issue of racist jury selection, also known as the Batson claim, the three judge panel of split 2-1, with Ambro dissenting. Abu-Jamal filed his appeal of this ruling with the US Supreme Court today, Dec. 19. Arguably the key issue will be the 1986 Batson v. Kentucky ruling, which established the right to a new trial if jurors were excluded on the basis of race. At the 1982 trial Prosecutor McGill used 10-11 of his 15 peremptory strikes to remove otherwise acceptable black jurors, yet the court ruled that there was not even the appearance of discrimination. In his dissenting opinion, Judge Ambro wrote that the denial of a preliminary Batson hearing "goes against the grain of our prior actions…I see no reason why we should not afford Abu-Jamal the courtesy of our precedents." Separately, the DA is appealing to execute without a new sentencing-phase trial, having filed their brief on November 14, 2008. Abu-Jamal’s deadline to respond to this is January 21, 2009. On March 27, the three-judge panel unanimously affirmed Federal District Court Judge William Yohn's 2001 decision "overturning" the death sentence. Citing the 1988 Mills v. Maryland precedent, Yohn had ruled that sentencing forms used by jurors and Judge Sabo's instructions to the jury were potentially confusing, and jurors could have mistakenly believed that they had to unanimously agree on any mitigating circumstances in order to consider them as weighing against a death sentence. According to this ruling, if the DA wants to re-instate the death sentence, the DA must call for a new penalty-phase jury trial where new evidence of Mumia's innocence can be presented. However, the jury can only choose between a sentence of life in prison without parole or a death sentence. The DA is appealing this 2001/2008 ruling to the US Supreme Court, so if the court agrees to consider the DA’s appeal and rules in their favor, Mumia can then be executed without benefit of the new sentencing trial. However, if the court upholds the 2001 and 2008 rulings, then the DA will either request a new sentencing trial or accept life in prison without the chance of parole. Notably, at the DA's request, during the post-2001 appeals, Mumia has never left his death row cell or been given general population "privileges" such as contact visits with family. Following news that the DA was appealing to execute without a new sentencing trial, I spoke with Dave Lindorff, J. Patrick O'Connor, and William Francome. Below are several graphics of the crime scene, based on the flyer made for the 13th and Locust crime scene presentation. THE MISSING TAXI: On Dec. 8, 2007, Journalists for Mumia gave a slide show presentation of the newly discovered crime scene photos, that were taken by press photographer Pedro Polakoff. This photo being presented, at the far right, shows the very back of Police Officer Daniel Faulkner’s police car. The large, empty space directly behind it, is where alleged “eye-witness” Robert Chobert testified he was parked, as he “witnessed” the shooting of Officer Faulkner. IS THIS CHOBERT’S TAXI? 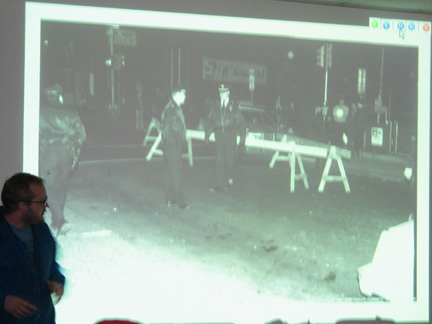 This crime scene photo appeared on a recent anti-Mumia You Tube video. The photo is apparently taken from 13th St., north of Locust, and facing south towards Locust St. This is exactly where investigator George Michael Newman states that Chobert told him he was actually parked. So, is the car on the left Chobert’s taxi? 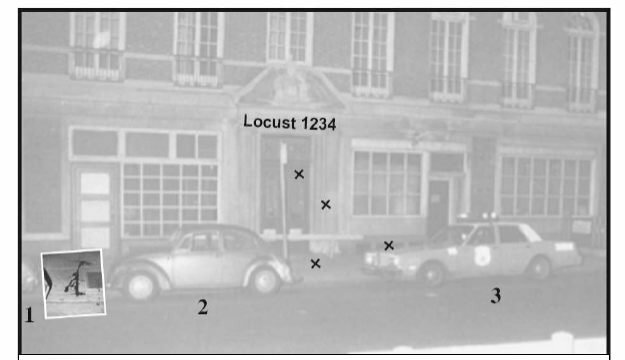 (4) Mumia’s car (5) Scanlan’s car (Short Arrow at 1234 Locust) The trajectory of the bullet inside the vestibule (Long Arrow From 4) Mumia’s direction approaching the scene. Note that Mumia’s direction is in contradiction to the bullet trajectory and the fragments found in the wall. Officer Faulkner was more likely shot in the back by someone standing on the curb next to Billy Cook’s car (2), with the bullet traveling North, away from 1234 Locust, after exiting Officer Faulkner’s body. The straight arrow shows where Police Officer Daniel Faulkner was allegedly standing and the direction he was facing when shot. The curved line shows Mumia’s approach before allegedly shooting Faulkner. 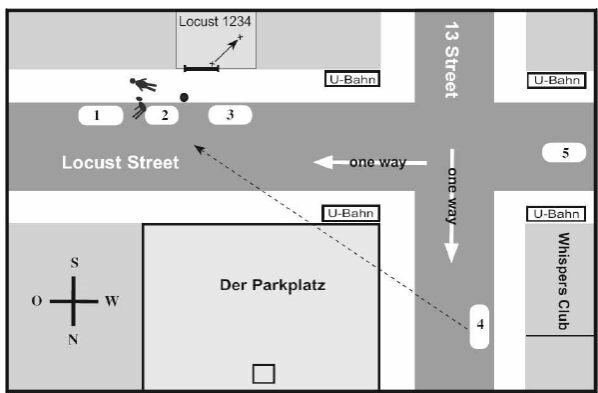 Accordingly, while Faulkner was standing in front of Billy Cook’s VW and facing west up Locust St., Mumia passed by Faulkner’s right side and looped around before shooting him in the back. The straight arrow shows where Police Officer Daniel Faulkner was allegedly standing and the direction he was facing when shot. The curved line shows Mumia’s approach before allegedly shooting Faulkner. 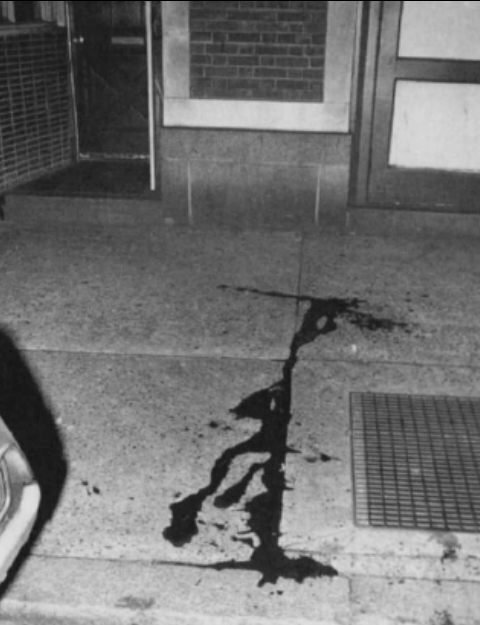 Accordingly, while Faulkner was standing in front of his police car and facing east down Locust St., Mumia came in front of Faulkner and looped around before shooting him in the back.